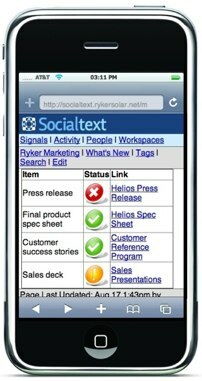 Collaboration platform Socialtext is taking its package of enterprise 2.0 services to the smartphone. The startup has launched Socialtext Mobile, a web-based mobile version of the Socialtext collaboration platform. Socialtext’s President and co-founder, Ross Mayfield tells us that Socialtext’s mobile interface will offer much of the same functionality as Socialtext’s Adobe Air-powered desktop application, which launched earlier this year. Socialtext mobile will automatically detect when a user is logging in through a smartphone and provides access to the optimized Socialtext site. Via a Blackberry, iPhone or Android, users can see and post to their company’s Twitter-like message stream and access their company’s Socialtext Workspace, an enterprise-ready wiki. The platform’s SocialCalc collaborative spreadsheet offering is also accessible via the mobile interface. The message stream lets workers see the microblogging messages of the co-workers they are following. In addition, there is also an “activity” stream that generates a micro-message every time a person a user is following takes an action inside the Socialtext platform, such as creating a wiki page, writing a blog post, or making a comment. Socialtext’s collaboration tool has a newly launched freemium model and a paid service, but both platforms are available via mobile devices for free. There’s no doubt that being able to access enterprise applications from mobile devices is useful to companies and their employees. But for many big companies, security is a consideration when deploying enterprise apps in a mobile phone. Socialtext customers can leverage Motorola’s Good Mobile Connection to provide behind-the-firewall secure deployment of Socialtext’s information on mobile devices. Socialtext faces competition from Yammer, Jive and and WizeHive.